In programming games, player have to develop algorithms for artificial intelligences. Programming games is a free game. This means that the source code is available to be studied, modified, and distributed. Most projects look for help with testing, documentation, graphics, etc., as well. Codewars is a programming game written by Timo Hallek and Ronny Peine. The latest version of the game is 0.3.0 RC4 on December 31th, 2004. It is licensed under the GPL. The game was written in the C++ and Perl programming languages. The astronaut watches as his winged grabber is about to change and recharge the shooting bot's power cell. Note the code to accomplish this on the right-hand side. Colobot is a free game. This means that the source code is available to be studied, modified, and distributed. Most projects look for help with testing, documentation, graphics, etc., as well. Colobot - colonise with bots - is a combination of a real-time strategy and a programming game. The player takes the role of an astronaut with the mission to find a habitable planet, after humankind plunged the Earth into an ecological catastrophe. The player is not on their own, but accompanied by programmable robots that can help in building and defending structures. Through a satellite link with 'Houston' she/he is directed to complete a number of missions on different planets. The game also involves a rather aggressive though evolving relationship with native alien lifeforms. Apart from the missions, there are also two game modes that instruct the player in the use of CBOT, the language used to program the bots. This language is rather similar to C++ and Java. During the missions, it's not really necessary to write code for the bots, but it is convenient to be able to adapt the programs Houston offers to the player. Version 0.1.6 introduced the Code Battle game mode, where players first provide all programs needed to operate a base and/or kill all enemies, and then let the programmed bots do their job without the possibility to interfere. The game provides three types of enemies: passive targets, pre-programmed bots and hot-seat play against a fellow human. consomaton is a free game. This means that the source code is available to be studied, modified, and distributed. Most projects look for help with testing, documentation, graphics, etc., as well. 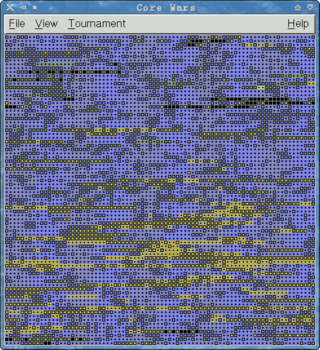 Consomaton is a puzzle game revolving around cellular automata. 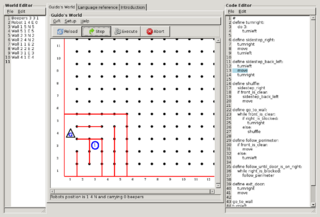 The player has to set or change the rules of the automaton so that they transform a given starting state in a console to another given goal state. Core Wars is a combat programming game in which warriors fight to the death in a virtual ring. It is written in the C programming language using the GTK library. It is developed by Philip Thorne and Walter Hofmann. The latest version of the game is 0.9.13(stable) released on October 31st, 2008. Infon Battle Arena is a free game. This means that the source code is available to be studied, modified, and distributed. Most projects look for help with testing, documentation, graphics, etc., as well. 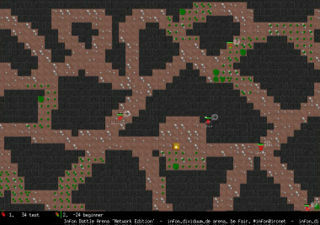 Infon Battle Arena is a real-time multiplayer programming game written by Florian Wesch. You control your creatures using the Lua programming language and let them compete for food and survival against other players. The game is client/server based and is playable over the internet. Players can upload code at any moment to update their code or fix bugs while the game is running in realtime. It is written in the C and Lua programming language using the SDL library. The latest release is 265 released on February 25th, 2008. The media and the source code are both licensed under the GPL. Liberation Circuit: Rogue AI Simulator is a free game. This means that the source code is available to be studied, modified, and distributed. Most projects look for help with testing, documentation, graphics, etc., as well. 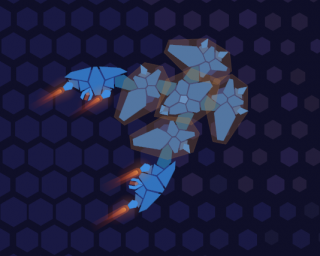 Liberation Circuit is a real-time strategy game about escaping from a hostile computer system, by designing and building units sufficient to the task. 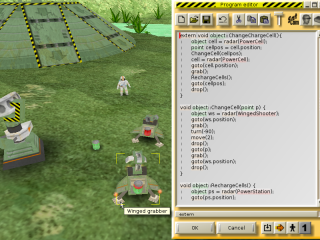 Unit AIs are written in a simple C-like language; in an optional programming aspect of the game, the player may fully customise the AI of the units they build using an integrated compiler and editor. Ruby-warrior is an AI programming game written in Ruby by Ryan Bates. It is licensed under a MIT license. This page was last edited on 18 August 2017, at 15:19.